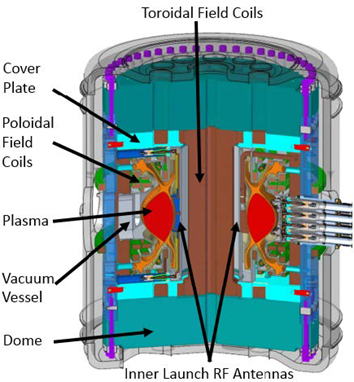 As noted in this earlier blog post, a tokamak is an experimental device meant to produce thermonuclear fusion power. The tokamak heats the hydrogen fuel to more than 150,000,000°C, which forces electrons to separate from their nuclei, thus creating plasma. 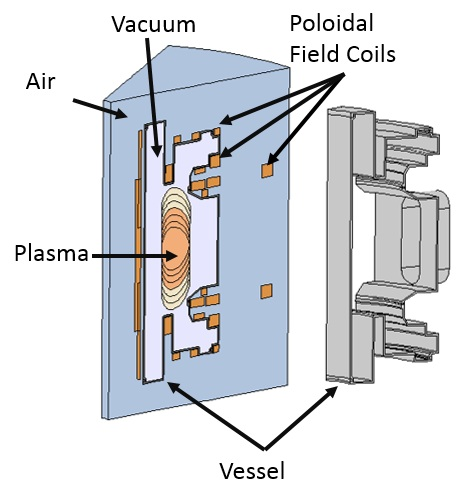 Magnetic fields are used to confine the plasma within a vacuum vessel. These magnetic fields keep the hot plasma away from the walls of the vessel and stronger fields can enhance the plasma’s performance. Plasma visible in the window of a tokamak. Image by Bobmumgaard — Own work. Licensed under CC BY-SA 4.0, via Wikimedia Commons. The magnetic fields’ ability to affect the plasma’s performance is one reason why researchers at MIT’s PSFC are focusing on a high magnetic field approach to fusion. Because fusion power is proportional to the magnetic field strength to the fourth power, any increase in the magnetic field strength greatly increases the device’s power and provides better confinement for the plasma. 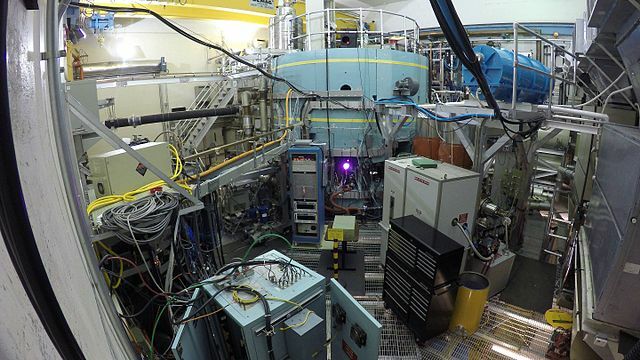 The Advanced Divertor eXperiment (ADX), a proposal created by PSFC and collaborators, intends to develop a compact tokamak with high magnetic fields. This tokamak would have densities, heat fluxes, and temperatures typical of a reactor, but would use short plasma discharges. A key innovation that makes the ADX different from other tokamaks is that rather than being made of a single cylinder, the vacuum vessel is modular and consists of five axisymmetric shells. 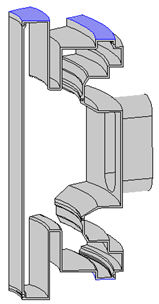 These separate shells provide a powerful advantage as they enable engineers to change parts of the design, such as the divertor, as further research is done and new discoveries are made. The proposed ADX tokamak design. 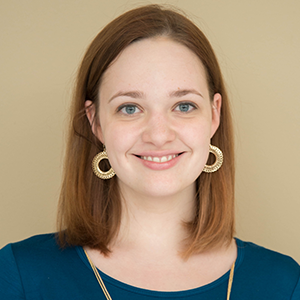 A major challenge for tokamaks is handling the high heat and particle exhaust from the plasma. These fluxes are taken care of by the divertor, and the ADX will be able to perform tests with a number of different divertor configurations and evaluate how each performs based on measured data. Another issue for tokamaks is plasma disruptions. During normal operation, the plasma carries a large electric current. For example, the plasma in the ADX is designed to carry 2 MA. In a disruption, the plasma equilibrium is lost when the plasma moves from its equilibrium position and then loses all of its current on a short timescale i.e., 1 millisecond. This type of disruption, where the plasma moves and then loses its current, is called a vertical displacement event (VDE). During a VDE, changes in the plasma result in rapidly changing magnetic fields, which drive eddy currents in the surrounding conductive structures such as the vacuum vessel. When these eddy currents cross the poloidal and toroidal magnetic fields in the tokamak, they create large Lorentz forces that the structure must be able to withstand. Left: PSFC’s vacuum vessel design. Right: Eddy currents in the vacuum vessel’s walls. In a VDE, the plasma can move closer to the vessel walls, and this proximity leads to larger loads on the vessel during the disruption. With this in mind, the PSFC engineers used a VDE as a test case to see if their vessel could support ADX operation. To reduce eddy currents, the vessel itself consists of Inconel 625. The researchers at PSFC chose Inconel 625 because of its high electrical resistivity and high strength. The electrical resistivity of this nickel-based alloy helped to lessen the magnitude of the eddy currents in the vessel. 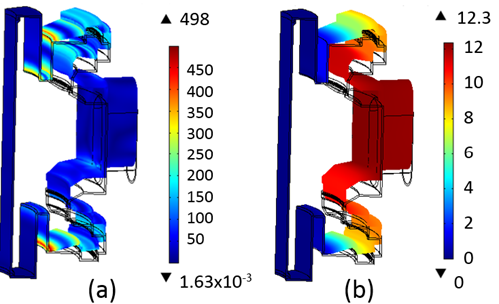 When the team tested their initial design with numerical simulation, they found large stresses and displacements within the vessel, as shown below. PSFC’s structural model of the vacuum vessel with a purple boundary showing where it is fixed. The simulations show stress (a) and displacement (b) during a VDE. The engineers then added a reinforcement block on one of the vessel’s boundaries. This stabilized the vacuum vessel, greatly reducing stress and wall displacement. With the addition of the support block, the simulation results indicate that the vessel can handle a plasma disruption and function properly in the ADX. PSFC’s structural model of the vacuum vessel after adding another support. The simulations show stress (a) and displacement (b) in the optimized model during a VDE. 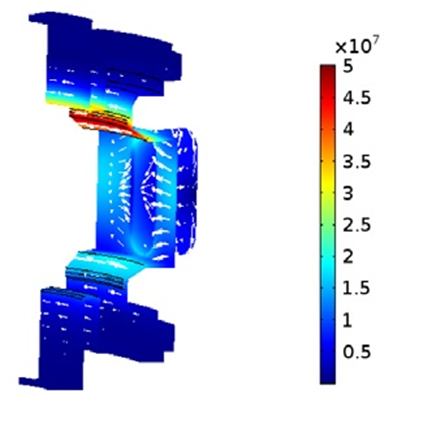 When it comes to designing fusion devices, simulation serves as a powerful tool for balancing efficiency with accuracy. 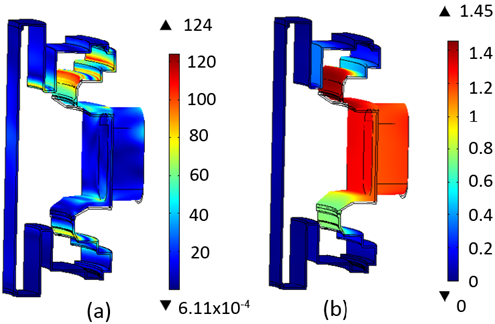 For the research team at PSFC, the COMSOL Multiphysics® software proved to offer reliable predictions of the magnetic fields in their tokamak design, matching well with recorded data. The flexibility of the platform also made it easy for the engineers to shift from one type of physics to the next, creating a smooth transition between different studies. With their simulation findings, the engineers at PSFC can ensure that their vacuum vessel, once manufactured, performs well within the ADX. Such advancements offer new potential in making nuclear fusion, and the power that it will provide, a closer reality.